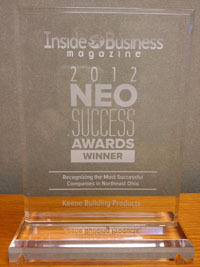 Keene Building Products is being recognized as one of the most successful companies in Northeast Ohio. Through continuous creativity in new developments Keene has added innovative enhancements to their existing products as well as created new products. Celebrating 10 years in business, Keene has proven to be a well-accomplished company that continues to grow. Thank you to all who support and work hard to make Keene Building Products a success.